Hello, thank you for your participation! Here is a short questionnaire to analyze your eating habits. The questions are very simple and will take no more than two minutes to answer. Are you a health/nutrition professional? I sometimes skip one or two meals in a day. I take well-balanced and nutritious meals as much as possible. I often eat fast food, pizza, or sandwiches. I often eat for pleasure and prefer lavish, gourmet meals. I eat little meat, fish, eggs, but lots of fruits and vegetables. I'm vegetarian/vegan, or I'm following a specific diet program. What would you consider your eating vice? I eat in large quantities. I always eat in restaurants. I eat too much food with saturated fat or sugar. Is your weight gain directly proportional to changes in your life? Yes, my romantic relationship, or my divorce. Yes, I quit sports or smoking. Yes, my job or my stressful life. Are there hormonal or medical causes for your weight gain? Where do you have the biggest tendency to gain weight? What has prevented you from successfully losing weight in the past? I do not want a strict program that takes a lot of time. I do not want to take supplements. I have tried many diets but I gain back the weight every time. I like to eat. Food is important to me. I have a love-hate relationship with food. When I'm not feeling well, I eat more than usual. 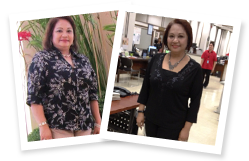 "People were amazed at how much weight I have lost. They kept on asking what I did and I just told them what I did in the program - follow the meal plans and read the sessions. No artificial medicines. It's all in the food you eat." *The testimonials presented are individual experiences that are neither advertisements nor guarantees. As with any diet program, monitored meal plans and regular exercise are required to lose weight for the long term. Always seek the advice of your physician before starting a weight loss program, an exercise program or when changing your eating habits. Total or partial reproduction is prohibited without prior agreement. Anxa.com collects and manages personal data in line with the Data Privacy Act of 2011 (HB 4115).